There are two special offers on for sew along participants. Caitlin at King & Co. Corsetry, based in New York City, will give participants 10% off everything in the store, English coutil, grommets, busks, and patterns for future corsets. This off expires January 15, 2012 at 11:59 PM EST. Use promo code SEW1911 at check out. 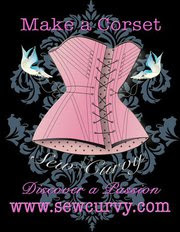 And Julia at Sew Curvy Corsetry, near Oxford UK, will give participants a 10% discount on corset supplies. She has a wide selection of coutils, busks and metal findings. This offer also expires January 15th, 2012, but at 11:59 PM GMT. Use the code bridges at check out. I'm going to take advantage of both offers. There are black grommets at King & Co. that I would love to finish a corset with, and Sew Curvy has satin coutil, which I have been wanting to use. A big thank you Caitlin and Julia for supporting the 1911 sew along! Here is a list of supplies needed to make a corset that fits approximately size US 6-8, a UK 10, or a European 38. If you are a few sizes larger, or smaller, you will need to adjust quantities accordingly. Tomorrow I'll post a list of answers to some of the frequently asked questions I've been receiving. Until then, we can gaze at the lovely Diana in the C.B. 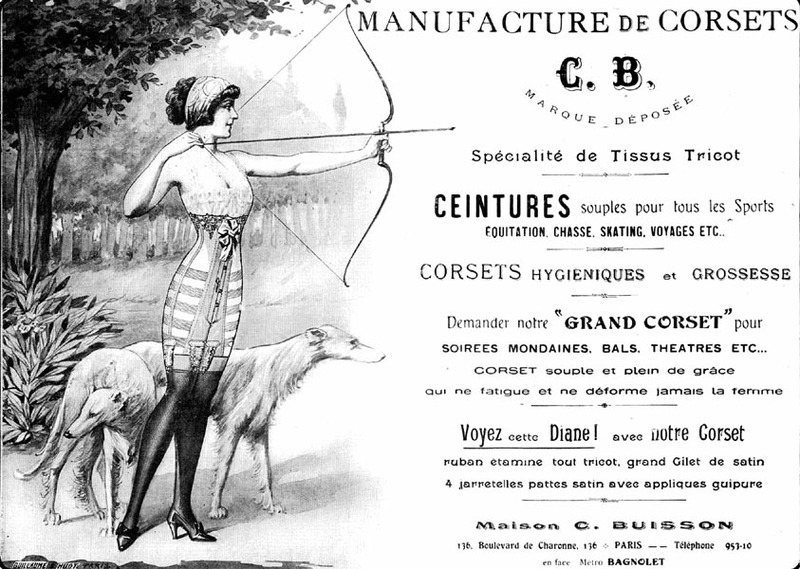 Corset ad from Dessous Elégants published in March, 1912. Are you going to give notes on how to fit this corset during the sew along? Where do you get 16 1/2" long flat steel bones from? Neither of these shops seem to carry them. Hello Forde, Yes! I will explain how to fit the corset during the sew along. We'll sew a mock-up first to assure the fit works before moving on to the real thing. Hi Jenny, That 16 1/2 inch length was exactly the length of bone in the original post edwardian corset I made. A 1/2 inch shorter, or ever 1 inch shorter will not affect the function of the corset. metal boning can always be trimmed and tipped, or you can substitute synthetic whale bone. I'll post links to a source for that soon. Buying continuous boning is cheaper - a bit more fiddly- but easy enough. You could also use spiral wire which is super easy to use and cut. Hi Julia! I'll be mentioning that in my next post! Hi Jo, I can't remember if the pattern you drafted for the YWU article is under or mid-bust? Sadly I need the support and even if it's not authentic I'll be making a mid-bust. Hi ista! That pattern makes just above an under- but not quit a mid-bust corset, it flares out just above the under-bust line. If you raise the top edge a couple of inches and extend that flare you should be able to adapt it quite easily. Period correctness be damned, I'm all for support. The materials list calls for 5 yards of 1 inch bone casing - and no one seems to have that size! i've found a lot of 1/2" and 3/4". do I need to make my own? or do you have a recomendation for a supplier of 1" casing. Oh my. I forgot, I made my own casings for the post edwardian corset and I made 1" casing, but 3/4 will work. Thank you for bringing this to my attention! What quantities of boning would I need for the Norah Waugh 1911 pattern? For the Norah Waugh pattern you'll need 8 of the 9 inch steels instead of 12. Her pattern is shorter than the post edwardian, but I plan on lengthening it so the lengths of the boning will be the same. Looking at Norah Waugh's pattern, the steels are completley different lengths to the edwardian, so, you think we'll potentially be lengthening the pattern? Going off the pattern exactly, it would require 4 x 9 inch 1/4, 4 x 10 inch 1/4. The 2x 1/2 steel is 12 6/8 inch and the other 4x 1/4 flats towards the CB are 13 inches. Im just wondering if I'll need to re order as Ive already ordered bones to the measurements off the supply list, what are you thoughts? We'll be lengthening the pattern so everyone can use the same supplies. No need to re-order! I'm working off the Norah Waugh pattern and when measured the 1/2 inch wide bones seem to be the same length as the longer bones, aka the 16 1/2 inch bones on the supply list. However, they are here listed as only 10 inches, which is way shorter than they need to be for the Norah Waugh pattern, even before extension. Can someone shed some light on this? You're so on the ball! On the Norah Waugh pattern the 1/2 inch bones and the bones at the center back are both roughly 12 1/2 inches long. I wanted to keep things as simple as possible and use the same bone lengths for both. Once we add a couple if inches to the bottom edge we can use the longer 16 1/2 inch bones at the center back, and if you prefer use 12 1/2 instead of 10 in the other channel you certainly can. I'll be using 10 inch ones. The 1/2 inch bones will not need to be longer, even with the pattern extension, since they don't run the entire length of the corset anyway. If anyone is looking for 1 1/4" garter grips to fit the style of the time period more, I have some listed on my etsy shop (and have additional quantity that aren't currently listed if folks want to PM me). Unfortunately I don't have the adjuster part, but I've made garters with just the grips just fine. 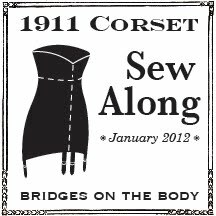 If anyone is just getting started, I highly recommend www.corsetmaking.com for supplies. I always use them. For this one, I ordered mine 2 days ago, and it arrived promptly this morning. They're also a storefront in Philly so you can stop by if you're in the area. That is super fast service! Excellent. Where do you find 2" bias trim? Should I try to make my own? You can buy bias trim at any fabric store or make your own. Making your own is easy and then you use colors and patterns you like. I'll go over how to make it later in the sew along when it's time to finish the edges of the corset. I couldn't find any 2" wide bias trim so bought some fabric to make some. Was just about to post asking you about this, but I see you've got it covered already. I should have guessed, you've thought of everything! I've had nothing but bad service with King and Company. Never receive a response on two orders. The order that I finally received was said to had shipped and they didn't officially ship it until the following Monday, when it was to go out last Friday. I am still waiting for a response from Caitlin and King and Company. This is the first time I ran into a bad Etsy experience. She won't be getting my business again. I'm so sorry to hear this. I hope everything is resolved soon. Hello! I'm a bit late! I wanted to do this sew along at the same time as everybody but... didn't have the time last year :) But I'll make this corset! I've one question: why do we take flat boning since some of the casings are very curvy? Will it work? Here's my pattern. I've got large hips but a tiny wiast (compared to the hips haha!) So, it's even more curvy! http://i55.servimg.com/u/f55/11/69/34/64/corset10.jpg I've always worked with spiral boning for victorian corsets, but I've never made a 1910 one :) Also, this is the first time that I make tranformations on a pattern with your method. As I'm french I hope that I've understood everything correctly... I still have doubts... :S Thanks for your time! The flat boning will work. The individual pieces are curvy and when sewn together the panels will curve over the body. But the channels themselves end up running straight from top to bottom so the boning only needs to flex in in one direction, if that makes sense. Feel free to email me with any questions that come up while patterning and sewing. I'm happy to help! Super late, but is there a way to adjust this for a plus sized woman? My waist is 71" and I'm trying to get into corsets as I lose more weight. I'm sewing my way through every corset pattern in Norah Waugh's book, Corsets and Crinolines. When I complete this challenge I hope to be able to say, "yeah, I can sew," and "yeah, I know a bit about corsets." Here's how the project began, and here are the ground rules. If you'd like to learn more about me please visit my profile.